Michael Gove is seen by many as the "poster boy" of the coalition. In the right wing press he is lauded for his "success" in taking on the "educational establishment" in particular the teaching unions. 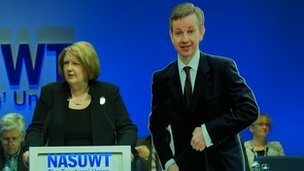 However Chris Keates, the General Secretary of the NASUWT delivered her conference keynote stood next to a cardboard cutout of Michael Gove who she described as "the "poster boy" for building support for teachers' unions". She claimed he was responsible for "soaring" recruitment to the union. There were no speakers this year from either the Conservatives or Lib Dems. Meanwhile the other large teaching union the NUT opened an attack on no less than three fronts starting with an attack on free schools claiming they they are wasting millions of pounds and having a negative impact on good and outstanding local schools. The Beccles Free School case, much covered on this Blog, is cited as one of the examples in a case study available for download on the NUT website. Beccles Free School plans to utilise the site of a middle school which is closing as part of the re-organisation of the Suffolk schools system. Opponents say it could jeopardise the future of a recently converted and highly-rated academy, Sir John Leman High School in Beccles. Jeremy Rowe, the Head Teacher at Sir John Leman has labelled the proposed free school a ‘disaster’ stating that: “You can’t invent children, there is a given number who go to school in Beccles. We remain full and the new school is empty or both are half empty. Either one is a waste of public money”. He believes the free school cost his school £1 million, or 15 per cent of his budget. A consultation meeting on the free school proposal held on 27 January also saw criticism from local residents. One parent described the plans as a ‘shabby compromise’ whilst another said that students at the school would be ‘guinea pigs’. There has been widespread cross-party opposition to the free school including from the local Conservative MP and Leader of Suffolk County Council. The NUT is obtaining Counsel’s opinion on submitting an appeal to the Information Commissioner over the refusal of the Secretary of State for Education to disclose under the Freedom of Information Act copies of the statutory impact assessments that the Secretary of State is required to make when he considers whether or not to approve the opening of free schools. The Union is not convinced that the Secretary of State has applied the law correctly when considering the impact of these new free schools on existing local schools. The Union’s research shows that many of the Free Schools already opened, and those due to open later this year, will have a negative impact on existing local schools. In many cases the Government is allowing Free Schools to open regardless of the concerns raised by local authorities, heads, governors and parents. The NUT also passed a resolution considering non-cooperation with Ofsted inspections in a move that could see inspectors told to leave classrooms by teachers. Meanwhile all the 22 teacher at Downhills Primary school, which Gove has forced to become an academy, who are all NUT members have are all claimed to be in favour of strike action. The union is pledging to pay members who strike and to call "discontinuous" strikes if a ballot is successful. I have no doubt the right wing press will portray the unions as "extremist" or "trots" and as is always the case the conference delegates are the more vocal members of the profession. But there is clear concern and in fact anger right across the teaching profession about the Government's education policies and not just from the "usual suspects". Gove might well be able to succeed using his friends in the press in giving the impression that these are union extremists that need taking on and defeating. But this isn't the miners strike and unless Gove has a stockpile of teachers somewhere he risks our children's education becoming the collateral damage in a war it will eventually be clear he started. Michael Gove, however, does look on target to succeed in doing something nobody has ever done before. Getting the fragmented teaching unions to work together.